Bob Ross is an American icon known for painting happy little trees on the widely popular show The Joy of Painting that aired during the 80’s and into the early 90’s. 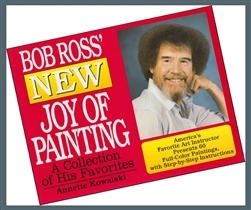 His calm demeanor, smooth tone of voice, and knack for “happy little accidents” appear to be second nature for the painter, but do not be fooled. Bob Ross was well versed, practiced, and prepared for each show. We can all learn a lesson from Bob in the importance of practice making perfect. 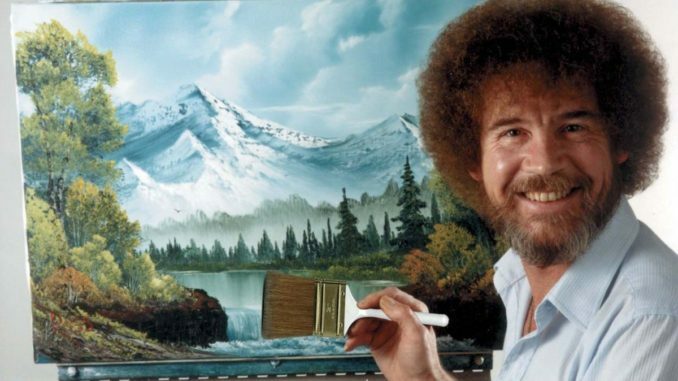 Did you know that when you see Bob painting on the show it is actually a copy? Before every show he has practiced his work once prior to the recording and uses this first draft for reference hidden off-screen. Bob then does the same painting a third time for a photo-shoot for his instructional books. 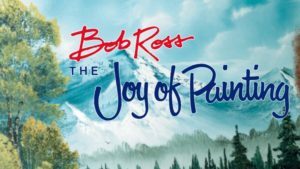 The Joy of Painting aired 403 episodes, which means Bob made 30,000 or more paintings. You could say he became an expert, so why did he still use a first draft? Courtesy of Bob Ross Inc.
Bob Ross was an expert painter, especially in regards to the wet-on-wet oil painting technique, because what would take another person 60 to 90 minutes to complete, Bob did in 30 minutes. What contributes most to his speedy brush strokes could be his first draft. Having a rough or first draft is not a new strategy for preparation, but it is still valuable even if you are an expert. Just as actors practice their lines, Bob practiced his too. Many of his phrases such as “sun of a gun,” “just a happy little picture,” “let’s get crazy,” and many more sound ad lib. These phrases are actually thought out and placed into his own mental script. His business partner Annette Kowalski said, “He told me that he would lay in bed at night and plan every word.” Also, by using the adverbs ‘maybe’ and ‘just’ frequently throughout his 30 minute show gave an air of spontaneity, as if he did not know exactly where he was going to place a happy little tree and its friend. After so many episodes why was it so important to Bob to know every word? It is important to be well rehearsed to keep within a time constraint, stay on topic, and to make sure the punchline is timed just right. Otherwise people may not laugh. From your first public speech to your one-thousandth, preparing can help you turn mistakes into advantages. Or as Bob says “we don’t make mistakes, we make happy accidents, and take advantage of them.” For example, if you are preparing a speech and you are getting tongue tied on a word and you are worried that you will mess up no matter how much you practice. Simply prepare for the mistake and how you will adjust. You may decide to make a sly joke about your mistake or just continue on, not spending too much time trying to repeat the word over again correctly. This piece of canvas is your world and you have to make big decisions. Take advantage of whatever happens. Sometimes we avoid this big brush but it can do incredible things. You can do anything on here that you want to do. If it makes you happy then it’s good. An adverse benefit of Bob’s show is that is has been putting people to sleep for years. Although Bob would prefer to have people watching his show to learn how to paint, he was not bothered when he would hear of people watching it to take a nap. Annette’s daughter Joan Kowalski stated that fans would go up to Bob and say ‘I don’t want to hurt your feelings, but you’ve been putting me to sleep for 10 years.’ Today, sufferers of insomnia are turning to Bob to put them to sleep. The Joy of Painting has become popular on social media channels that list the show as a trigger for those seeking an Autonomous Sensory Meridian Response (ASMR). 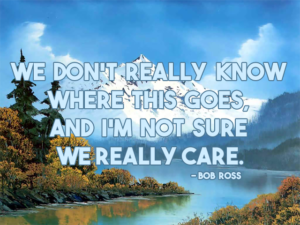 Whether you are looking to learn how to paint, wanting to turn your mood around, or taking a nap, Bob Ross is your guy. Corruption: Is Haiti on the Path to a New Revolution?